Few things are more frustrating than a broken printer or copier when you need to produce important business documents like invoices, shipping tickets, or sales proposals. Whether your business is large or small, based in Los Angeles, Vegas, Miami, New York, or anywhere else in the country, we guarantee professional, timely, and effective printer repair service to businesses nationwide. From the most complex repairs to simple fixes, we are committed to providing our customers with exceptional service and support so you can get back to work. You can count on Monster Technology for your printer repair needs. To keep your office equipment in optimal condition, regular maintenance is needed. Monster Technology provides preventative printer maintenance solutions. Regardless of how careful you are with office technology and equipment, ribbons, print heads, and fusers inevitably wear out. From the active office to the small one that uses printers moderately, anyone can experience these effects, which may lead to diminished quality. To avoid this, we recommend periodically having your equipment maintained and cleaned by a Monster Technology service technician. Our manufacturer-authorized and trained technicians provide regular maintenance and/or service repairs to keep your office technology in peak operating condition. All machine types – Printers, Laser Printers, Barcode Printers, Thermal Printers, Copiers, MFPs, and more! All manufacturer types and brands – Toshiba, Sony, Lexmark, Samsung, Canon, Brother, Konica Minolta, OKI, Xerox, and more! 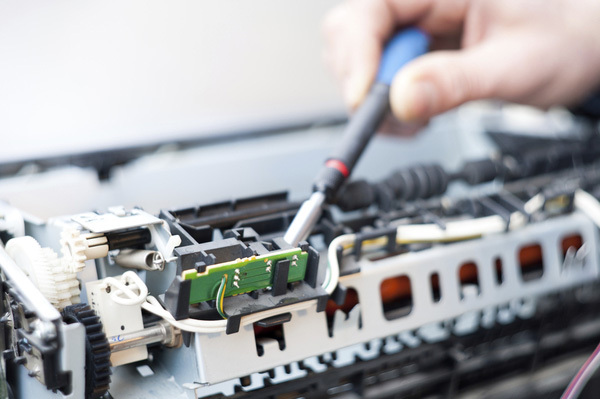 Our certified printer repair services will alleviate the headache of device downtime, delivering fast, effective, and professional solutions to your copier and printer problems. If you’d like to totally remove the hassle of managing your printers, let us take care of it with our Managed Print Services program. Contact Monster Technology today to get started.